Until the age of 39 I had a secret which I guarded zealously. Only my family and close friends knew about it. Before I turned 40 I decided to get rid of the shame, and now it’s your turn to hear it. My name Sarit Rotman, I am an artist and an advertising creative. At the age of 16 I was diagnosed with anorexia. and after convincing my parents that I could get out of it alone, I ended the treatment. A difficult and depressing eating disorder that accompanied me from the age 18 to 31: it was there during my army service, on the trip to South America, and during the four years of design studies. Black and dark beast that never let go and did not let me rest. They say that consciousness is 90% of the solution. I was aware of my illness from an early age, and in my adult life I tried to take care of myself: I went to psychologists, psychiatrists, alternative therapists, but none of these treatments helped. Painting has always been my refuge. Lots of black, sadness and frustration were present in my paintings. In one of my classes in college my art teacher asked me to take the black out of the scale. “You escape there too quickly, do without it”, he said. By challenging me he was, in essence, the first person who gave me the option to take the black out of my life. 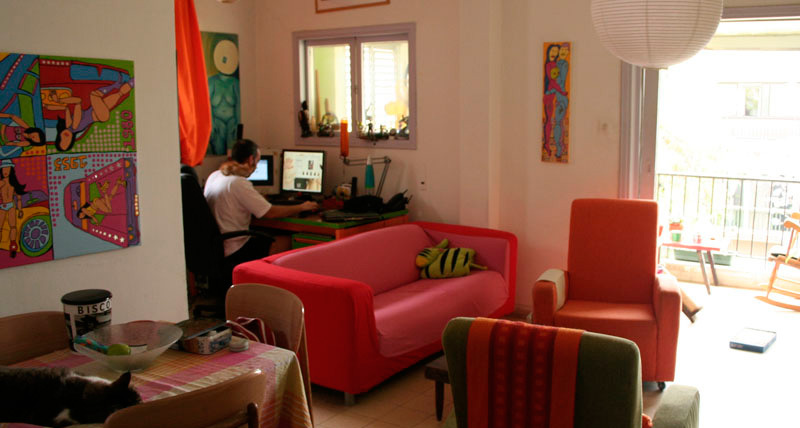 After I graduated, I came to Tel Aviv and started working in advertising agencies. Since I lived with roommates, the disorder became far more burdensome. The side effects worsened: many frequent dental treatments, hair loss and stop of the menstrual cycle. Before I turned 30 I went on to live by myself. The disease escalated, self-beating and austerity were an inseparable part of my life. I did not believe I would reach the age of thirty, and suddenly, to my great surprise, I passed that age. What now? I had no dreams for the future or long-term plans. One day, a good friend told me that I should add a painting of a relationship to the apartment, I decided to draw something spontaneously using leftover wall paints and in a new style. Thus the first painting which opened the door to many more was born. For a whole year I painted in every spare moment, before and after work, on weekends and holidays – any free time was devoted to painting. At the beginning, the paintings were cynical. But gradually I opened up and allowed myself to dream. I let my subconscious speak, not the rationale. At the end of that year the house was full of color, optimism and love. At the end of that year my partner arrived. And I, contrary to any “sick logic”, let him enter. Slowly I opened my heart and my life to him. And he, surprisingly, stayed. Today, 12 years after the beginning of the process, I am healthy, happy, in an amazing relationship and a mother of two wonderful boys. Today I live the rosy vision that I created. In retrospect, I was surprised to find out that much of what I painted at that time was fully realized. Against the background of my personal story, in 2012 “Project 2020,” an optimistic social art project, was born. The project, which was crowd-funded, aims to give hope to women who suffer from eating disorders and raise awareness of the problem. During the project, which lasted approximately three years, I met with women suffering from anorexia, bulimia and compulsive eating. Based on our meetings and a detailed questionnaire I prepared, I drew to each of them a painting: a personal and optimistic mirror for inspiration, a future visual vision for 2020. I believe in the power of my art to do good and spread light and love in the world. I invite you to come in and look at my paintings, which completely changed my life. Painting for me is not an activity but a need and therefore it is an inseparable part of my life. It is a medicine without a prescription, which allows me to cope, grow and reexamine myself time and time again.